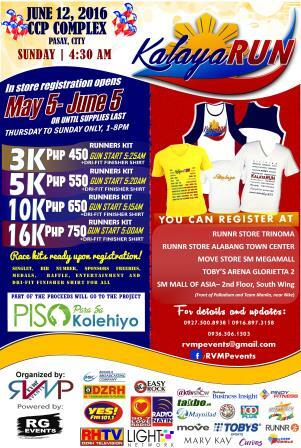 After the success of "PagmamahaRUN" last February 14, RVMP Events is now bringing another celebration-inspired run. This time, it's inline with the Philippine Independence Day. Now in-partnership with RG Events, RVMP Events is bringing "KalayaRUN," a benefit run to support Piso Para sa Kolehiyo (PPK), a Non-profit, Non-Government Organization that supports scholars that were transported to Manila from the severely devastated areas hit by typhoon Yolanda. Piso Para sa Kolehiyo headed by missionaries, aims to bring a lasting help to the Yolanda victims by gearing these scholars College education that will have a lasting effect in their future. On May 5, 2016, a media night of this exciting fun run has been conducted in Bistro Paleta in Malate, Manila. I'll share with you in a separate blog post the coverage of Runner Rocky during the media night.